A nice article by @DW_BarbSchmitz in Design World. I’m hearing the same from my customers. What about you? A lot has been written in the press lately about the comeback of U.S. manufacturing. Several factors come into play here. Cost creep in China–due to rising inflation and wage expectations–means that as soon as 2015 the U.S. could be in cost parity with Chinese manufacturing. Fears regarding IP security have also forced manufacturers to rethink offshoring strategies that once promised competitive cost advantages. Both of these trends are fueling what’s being called the “nearshoring” or “inshoring” trend, that is, companies bringing manufacturing back to the U.S.
Major companies, such as Ford, Apple, Caterpillar, and GE have moved nearly 20,00 manufacturing jobs back to the U.S. from Asia and Mexico with the last couple of years. Another advantage of having of onshore manufacturing is that having the capability to manufacture close to where customers are located can increase customer responsiveness and decrease turnaround times, making the supply chain more predictable. Another factor contributing to an uptick in U.S. manufacturing is that the fact that natural gas prices have been reduced by two-thirds since 2008, making the U.S. more competitive for gas-intensive industries, such as petrochemicals and fertilizers. Perhaps the biggest factor, however, is the wave of technology advancements (digitization, data analytics, advanced automation, Internet of things and additive manufacturing) that are changing the landscape for U.S. manufacturers. Many of these advancements are driven by software innovations. CAD and simulation software continue to improve manufacturers’ ability to create high-quality products faster than ever, cutting out expensive physical prototyping that in turn reduce design costs. New additive manufacturing and 3D printing applications are making it easier for more players to become innovative manufacturers without the traditional constraints of high-volume manufacturing. Crowdsourcing and crowdfunding sites and platforms are also encouraging more would-be inventors to enter the market. 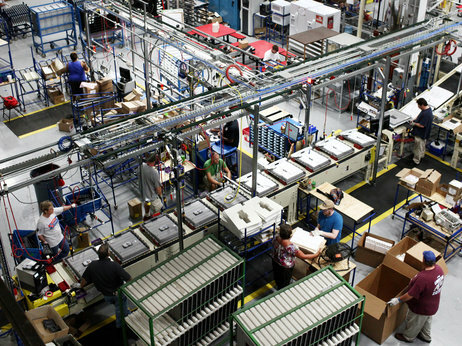 Robotics are reducing the need for labor, again reducing the cost of manufacturing products. The ability to embed sensors through the whole system, link them through the “industrial Internet,” and extract insight from the data means that U.S. companies are now leading the world in accelerating product development cycles and delivering on the promise of mass customization. What is the result of all these innovations? According to Mark Muro, senior fellow at the Brookings Institution, it means, “The game is now being played on American terms. Software and brilliant machines are erasing U.S. cost deficits and giving it a shot at lasting production leadership,” says Muro.